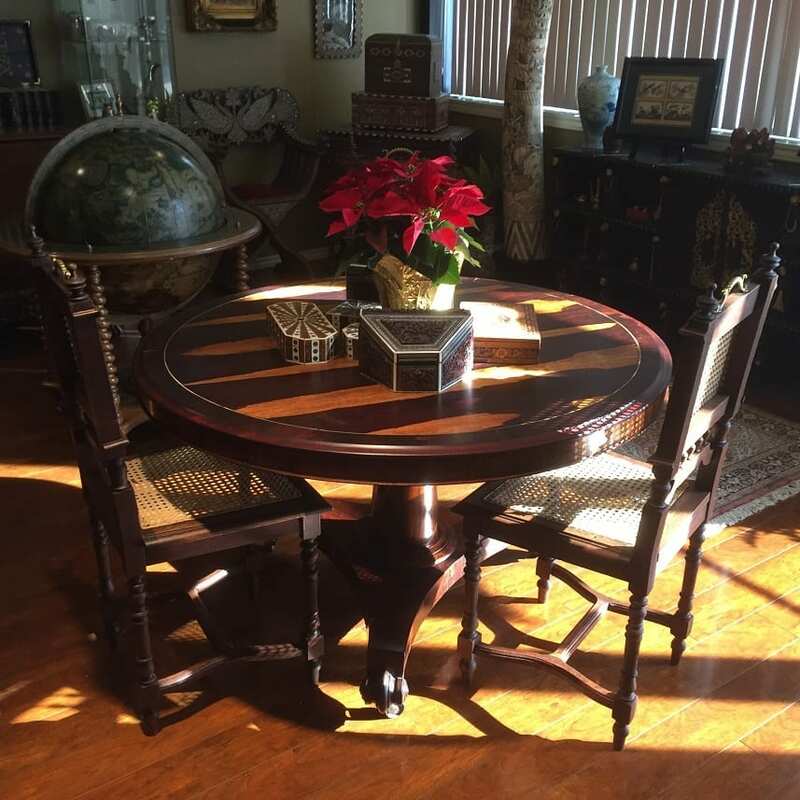 19C British Regency Rosewood Tilt top Center Table. 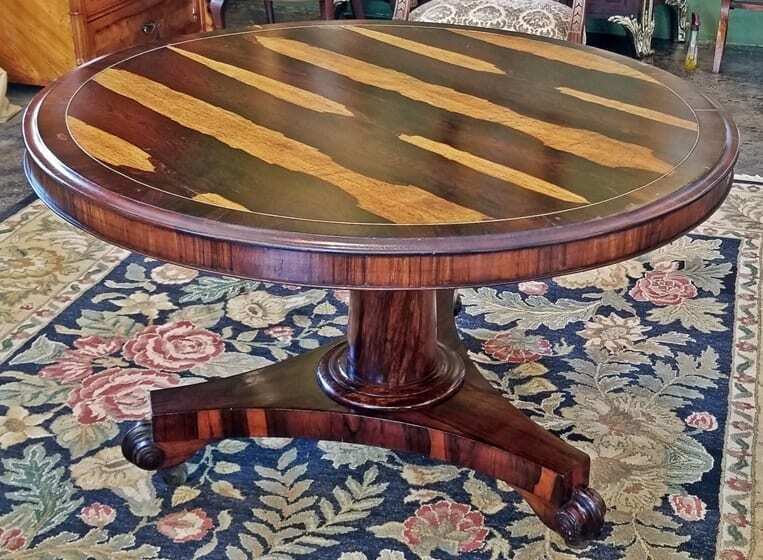 ABSOLUTELY GORGEOUS Early 19th Century…..Regency………Rosewood Tilt-top Center Table. 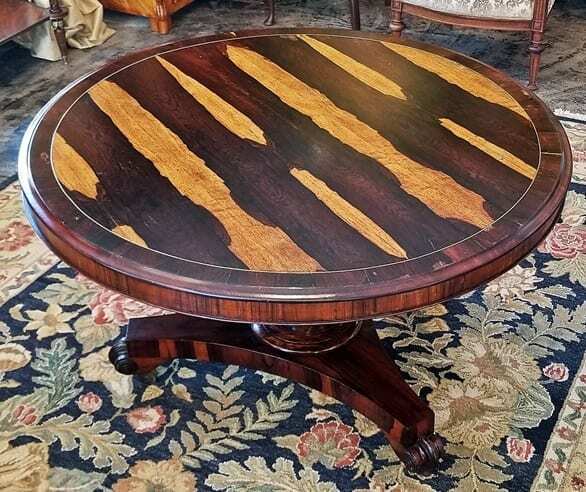 The Patina on this table is simply STUNNING…………..it is reminiscent of tigerwood but is rosewood. 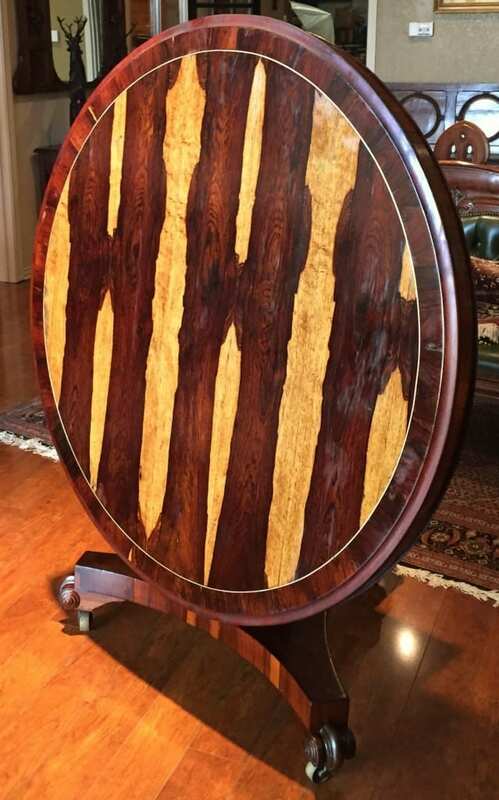 It is inlaid with a brass ring on the top. It has a 57 inch diameter and 57 inches tall and is beautifully proportioned. The tilt mechanism works perfectly. 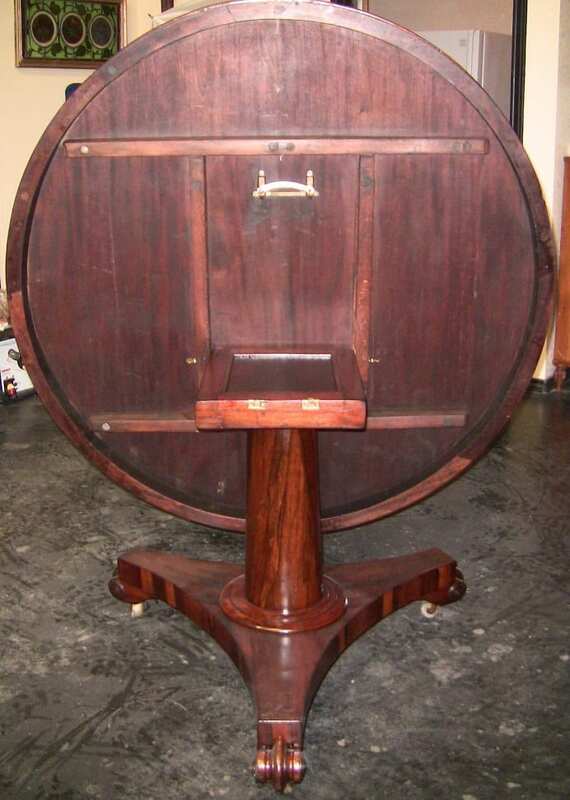 It sits on a cylindrical center column and tripod base with beautifully turned feet on original brass castors. You will not find another one like it !!! REGENCY PERIOD: The Regency in the United Kingdom was a period when King George III was deemed unfit to rule and his son, the Prince of Wales, ruled as his proxy as Prince Regent. On the death of his father in 1820, the Prince Regent became George IV. The term Regency (or Regency era) can refer to various dates with some given a longer period than the decade of the formal Regency which lasted 1811-1820. The period 1795 to 1837 (the latter part of the reign of George III and the reigns of his sons George IV, as Prince Regent and King, and William IV) is often attributed as the Regency era characterised by distinctive trends in British architecture, literature, fashions, politics, and culture. The Regency era formally ended in 1837 when Queen Victoria succeeded William IV. The Regency period as it relates to fine arts does not start or end on one day; there is both a build up and a denouement. Many things affected furniture design, from the practical to the events of the day. The Regency PeriodThe Regency period ushered in different ideas in house design for the influential. There was a greater emphasis on more open, informal (comparatively speaking) room arrangement, more thought given to the functionality of a home; how to make it more convenient and comfortable. Windows became larger; the indoors and the garden merged; and furniture became lighter and smaller scale so it could be moved more easily. The notable military engagements of the time proved to have an important influence on design. English Regency design developed over thirty years and had several different roots, phases and crazes, but it centered around the changing tastes of the Prince of Wales. The Prince of Wales was enamored of French design. In 1783 he appointed Henry Holland to start on what was to become almost a forty year project: the redesign and furnishing of Carlton House in which he created an atmosphere The Regency Period appropriate for the Prince’s superb collection of French furniture. The French influence of Louis XVI style on English designers is one thread of the fabric; the classical thread as exemplified by the designs of Thomas Hope is another, as are the revival of Egyptian motifs and the reinterpretation of Chinese themes. brass galleries, brass bosses on chairs at the juncture of leg and seat rail, brass casters from the simple to the lion paw, brass grills on doors, brass rods in lyre-shaped ends, applied gilt brass ornaments in cabinet friezes and plinths are just a few of the ways that metal was used to enhance wooden furniture. 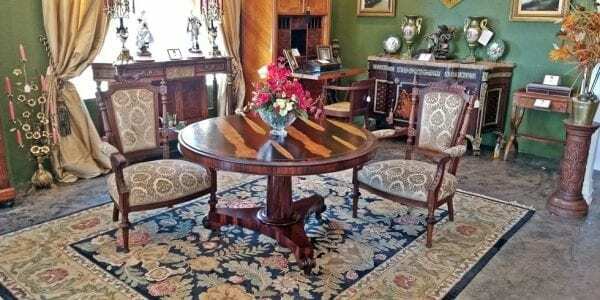 Regency furniture glories in flamboyant wood and graining, seeking out mahogany timber with flame grains, rosewood and zebra wood, while also using ebony for inlay and ebonizing other woods to create a surface that would yield a gleaming background for painted or metal detailing. As the Regency period progressed, the more delicate furniture designs were superseded by heavier, more massive pieces. 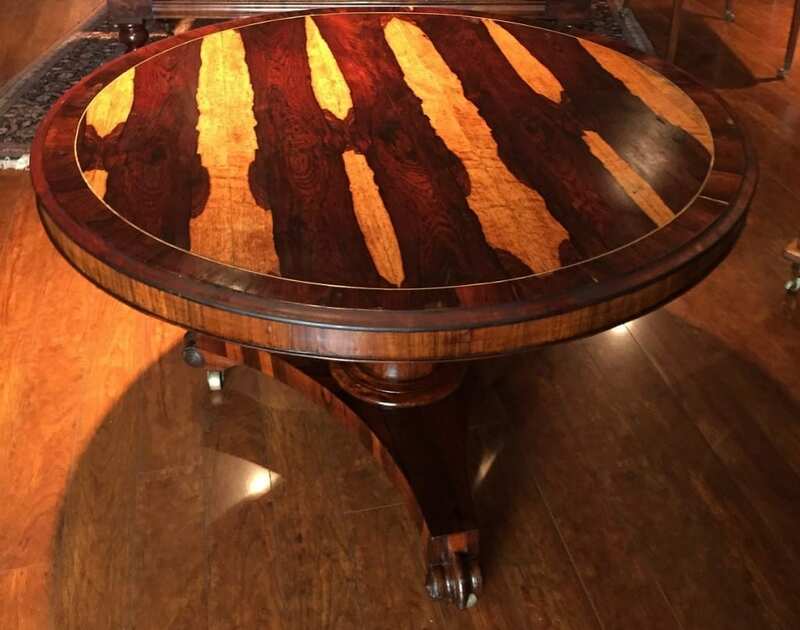 The introduction of lighter colored woods such as amboyna, satinwood and maple helped to mitigate the heavier scale and proportions that had become popular in the second and third decades of the 19th century. With so many threads interwoven during this period, one expects and finds reinvigorated design motifs from classical Greek, Roman and Egyptian periods, as well as the ever popular Chinese taste. There were several famous furniture designers during the Regency era and they all contributed to the flavor of the times. 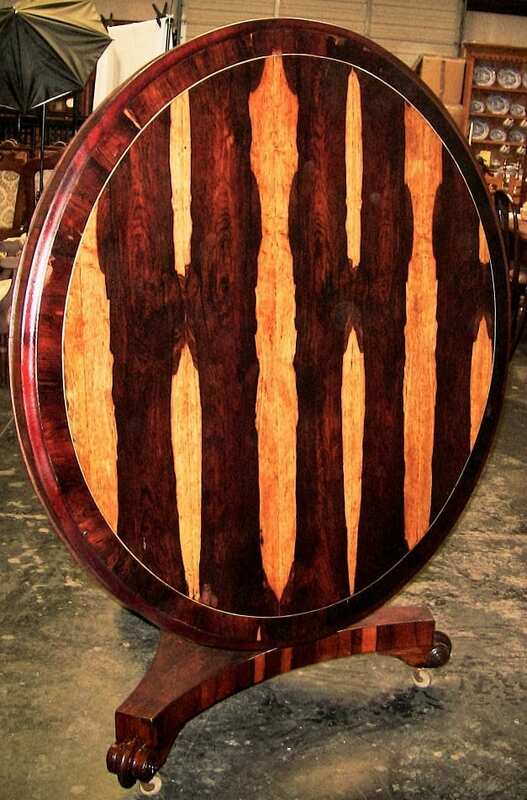 The concave square formed or e Regency Period Furniture alternately oblong section saber leg became important shapes during this era, as did the scroll-shaped arm. The cross-framed stool, the window seat which sat in front of windows that reached the floor, the sofa table, designed to go in front of or behind a sofa, the elegant lounge, reminiscent of a Grecian couch – all speak to changes in lifestyle and home design during this era. Maritime motifs became strongly manifested in the form of dolphin-shaped feet for settees and lounges. Egyptian figures (head and feet) became columns on sideboards or monopodia on side serving tables. The lotus flower, bud and leaf; papyrus and palm; winged sun disc were used in innovative manners on diverse pieces of furniture. Animal heads and paws and legs (lions and rams were favorites) became popular motifs found on chair legs and arms. Classical figures and lion heads were incorporated into handles and hardware. The star shape, a classical device, is a quintessential Regency symbol, used as backplates for handles, to emphasize joints in furniture, painted on decorative objects, inlaid on chair rails or cabinet friezes. Ornamentation using incised lines or grooving, or reeding, or metal ornaments became widespread. 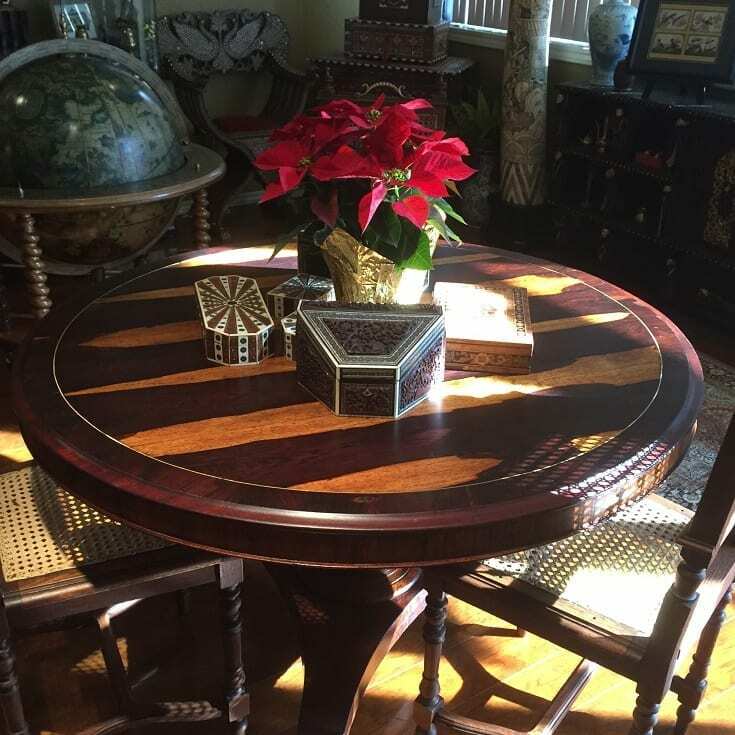 Ebony inlay surpassed boxwood or satinwood inlay. Early in the Regency period Sheraton’s delicate “bamboo” fashion was the craze; somewhat later lyre-shaped supports became popular. The Regency period is a long period encompassing many themes. Initially Regency furniture is delicate. Scrolling shapes and graceful curves punctuate and soften smaller scale furniture, particularly chairs, stools and lounges. A romanticism is evident in detailing inspired by ancient Rome, Greece and Egypt as well as by the heroes of England’s navy. 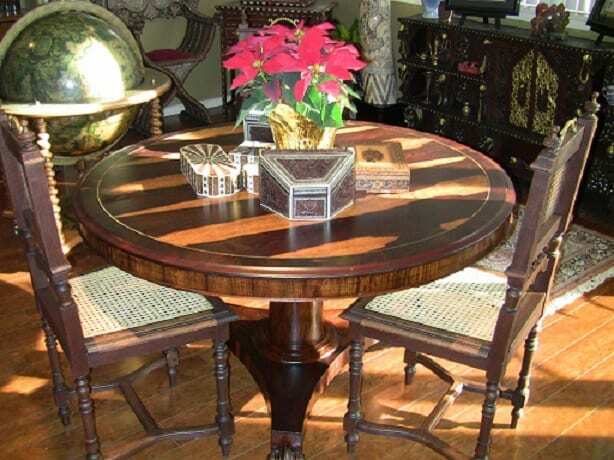 Flamboyant woods were often utilized in place of elaborate inlays or extensive carving. Surfaces were enhanced with metal inlays, mounts and overlays. 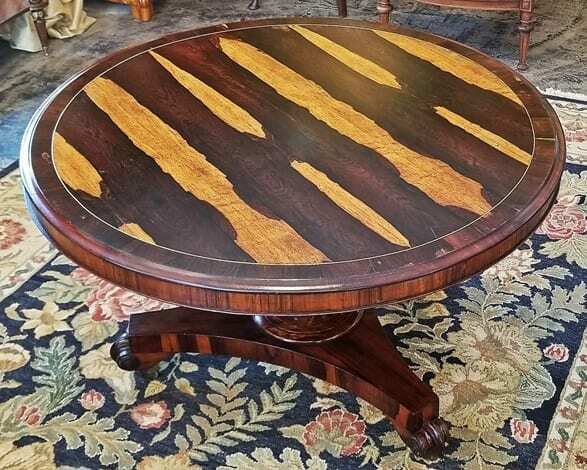 By the end of the Regency period, furniture had become much heavier and larger with supports for tables becoming thicker; delicate shallow reeding morphed into narrow deep grooving; elegant saber legs gave way to heavier turned legs or stumpy turned feet; gothic detailing reemerged, sometimes playfully, other times with a heavy hand. Dimensions: Top Down: 28.5" tall with diameter of 46.5"